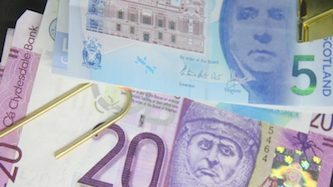 Output across the Scottish private sector increased at the fastest pace since October 2017 at the beginning of the second quarter, according to the latest IHS Markit Scotland PMI (Purchasing Managers’ Index). Furthermore, greater staff levels reportedly contributed to improved business sentiment and also enabled firms to clear backlogs of work. Survey data also signalled sharper increases in both input costs and output prices. The seasonally adjusted headline IHS Markit Scotland PMI – a single-figure measure of the month-on-month change in combined manufacturing and services output – recorded 52.6 in April, up from 50.8 in March, to signal the strongest rate of expansion in private sector output in Scotland since October 2017. Any figure above 50 suggests expansion. The latest upturn was a reflection of an improving service sector, as manufacturing production fell for a third straight month. Private sector new order receipts rose solidly in April and to the greatest extent since December 2014. Stronger demand was primarily linked to new client acquisitions and successful tendering for new work. A broad-based increase in new business was recorded. Service providers observed a noticeably stronger rise in order book volumes than their manufacturing counterparts. To accommodate greater demand, Scottish private sector businesses recruited additional staff in April. “The rate of job creation, albeit only moderate overall, was relatively marked and the fastest in eight months,” said the report. “Furthermore, the acceleration in employment growth was seen across both the services and goods-producing sectors. “In line with greater staffing levels, outstanding business in the Scottish private sector decreased, extending the current sequence of falling backlogs to 40 months. “That said, manufacturing and service providing firms observed slower rates of depletion in unfinished work during April. “Operating expenses faced by private sector firms in Scotland rose substantially during the latest survey period. “Moreover, the rate of input price inflation quickened to a three-month high. “According to anecdotal evidence, food, fuel and labour costs had all increased. Sector level data indicated that manufacturers observed greater cost pressures than service providers. “In order to guard against profit margin erosion, average selling charges were raised during April. “Some panellists suggested that robust demand conditions had enabled them to share part of the increased cost burdens with clients. The rate of output price inflation was the sharpest in 15 months. Joe Hayes, Economist at IHS Markit, which compiles the Scotland PMI survey, said: “Private sector business activity expanded to the greatest extent since October last year in April, aided by the strongest influx of new work in 40 months. “Buoyed by healthier demand conditions, confidence improved to the highest since January. “To accommodate the gain in workloads, additional staff were hired in April. “The rate of job creation was solid, accelerating in both the manufacturing and service sectors. Increased employment also enabled firms to clear backlogs of work and alleviate capacity pressures. “Margins continued to be squeezed however, with input costs rising sharply and to a faster degree in April.